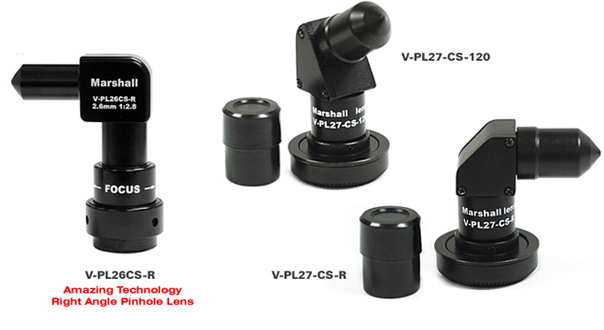 Marshall Electronics Optical Division - Wide Angle and Long Focal Length Pinhole Lenses for security, robotics, OEM applications, automobile, industrial video, covert security, and surveillance industry. These lenses are the latest generation of pinhole TV lens technology. They provide high resolution and high fidelity images with very little distortion to picture quality. They can see an entire room through a hole less than 0.15 inch. These lenses are designed to work with 1/3", 1/4" and 1/5" format CCD cameras. Most of these pinhole lenses work with either 12mm or C/CS mounts to accommodate miniature and standard size CCTV applications. Focal lengths range from 2.5mm to 70mm ensuring that any covert surveillance application can be met.